Personally, I don’t like reviews. I think they are highly opinionated, utterly sentimental and directly related to book sales. But often I ask myself if sentiments can be distilled completely from a work of art. Can sentiment, the gnawing emotion that wills pen to paper and occasions the resultant work, be separated from Arts? Absolutely not. So we can safely conclude that Sentiment is the artery through which Arts in itself is fed and one is tempted to end it there. 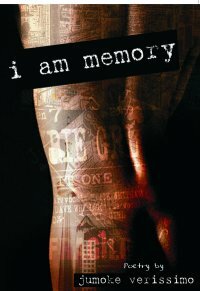 In the fashion of American writer Richard Matheson’s novel recently made into movie, I Am Legend, Ms. Verissimo substantiates her claim to her chosen genre with her first collection of poems, I Am Memory. Erstwhile Jumoke Verissimo has been heard and read both as a performance poet and in literary journals respectively and I must say, her collection was anticipated and timely. I noticed the book features about thirteen poems, divided into four sections (memory lanes) after I got past the rather lengthy acknowledgments. Then I leaped into the first of her offerings which perhaps is her most outstanding poem, Sequence (of desire). This love poem is nothing like the Shakespearian sonnets, or Robert Frost’s verses, its much bolder, penned specifically for performance. The lyricism is quite remarkable and works in tandem with the eloquent string of emotions that built into a robust narrative on one of the most unifying themes in the universe. Recently I was privileged to watch a live performance and I was struck with awe. As a poet, Ms Verissimo is versatile as well as judicious in her use of literary mechanics to furnish poems with a fluid progression. Like the Free Verse poet she is, her style borders more on internal rhythm than rhyme and stanzas. And her stanzas, often uneven, neither mince nor maneuver words. Rather they hit the proverbial nail on the head. Generously, she coins words with pun intended. Words such as Shell-ers, aba-shed are used to further buttress and delineate her emotions, setting them as roots and templates for revisiting issues that bulked most of her themes. Truly, an African poet can’t be without activism. I Am Memory revisits past issues swept under the carpet of history, gnaw at old scars and initiate new tears and perspective to the several woes that have betide the Nigerian state. So often, the poet assumes an angry tone and one could envision the pains the poet had undergone to sift such inflammatory emotions into verses. Her poems tackled themes like tyranny and dictatorship, hunger and famine, unsolved murders of politicians, unjust killings, leaving out only HIV/AIDS to have become a complete personal reproach on African sensibilities. However towards the end of the book, the quality of the poems dwindles below the standards of the earlier poems, especially the section dedicated to people. Ms Verissimo has penned a book of nostalgic history. She has collected poems that truly reflect the reactions of a bona fide Nigerian to the turbulence and tribulation the Nigerian state has suffered almost endlessly, needlessly. This collection is a bold stance of pain and other emotions, filtering through the pores of gross indifference and achieving a communal cry of retrospective protest. With I Am Memory, Ms Verissimo asserts and secures herself a seat on the table of the new Nigerian contemporary poets, the likes of Ifowodo Ogaga, Chiedu Ezeanah, Lola Shoneyin, Afam Akeh, Tade Ipadeola, Niran Okewole, etc. No doubt she will be heard from for a while. I AM MEMORY is a good work of poetry. I had a good read. Verissimo has got a way with witty statements. It is what drives her lines. The review? Not bad at all. Although, illustrative lines would have been great!